What is wrong with my papaya? First of all – a big THANK YOU to the nearly 15,000 people who have logged on to to this blog since I started just a year ago. I have absolutely loved sharing this information with you – finding the process of research and writing both stimulating and rewarding. As I said to my husband the other day – I never know where this blog is going to take me – his reply, “Up the garden path”!! When I came back from my trip overseas we had been away for over two months and the garden looked mostly OK. But, one plant looking very sick was my papaya. I had struggled for a while to keep it disease free but now had definitely lost the battle. ANTHRACNOSE affected fruit – note the pinkish sunken spots that eventually rot large areas of the fruit. WHAT IS IT? TWO different FUNGAL diseases that are common to this part of the world and anywhere that has high rainfall and subsequent high humidity. 1. BLACK SPOT Asperisporum caricae – a fungal disease which causes the black spots on the underside of the leaves, and while mostly cosmetic on the fruit this condition does affect the overall vigour of the tree (by reducing the ability of the plant to photosynthesize). Plants are more susceptible in cooler months. 2. ANTHARACNOSE -Colletotrichium gloeaporides – this is a fungal disease that causes watery spots on the fruit and then rapid rotting and spoiling of all the fruit. It starts as dark sunken spots or lesions and pinkish spore masses may form on the spots. This can also affect harvested fruit if the fungus has take a hold. This disease is spread in water droplets and is worse in warm, humid weather. It can also be spread by infected seed. My quest in trying to clearly to define these from ‘expert’ sources had definitely led me up the garden path – even my local fruit nursery misdiagnosed the problem. So, I suppose the lesson here is that you have to observe closely and do your own research. The most important thing I learned was- PROBLEMS WITH PAPYAS ARE CLOSELY LINKED TO NUTRIENT DEFICIENCIES IN THE SOIL – fix the soil, fix your papayas. Now, read on………………! 1. CHOOSE THE RIGHT PLANT: Check before you plant that they are healthy and disease free. WHERE TO PLANT? Papayas like a well-mulched soil that is free draining. Try to plant away from other shrubbery as a free air flow will help to reduce fungal spores from spreading. 2. 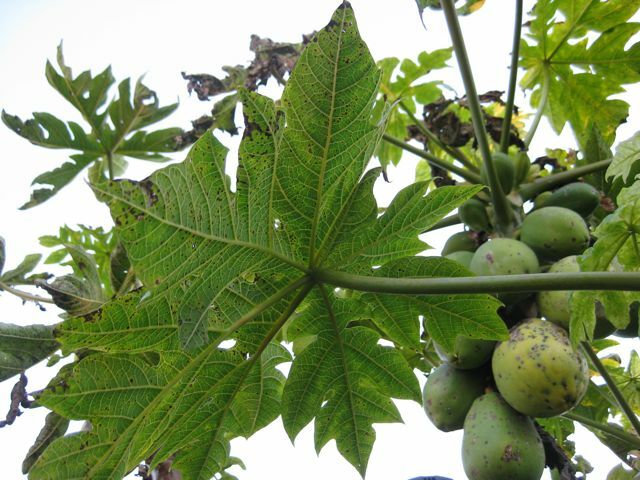 SOIL PREPARATION: Papayas are very susceptible to nutrient deficiency which weakens the plant and renders them more vulnerable to these fungal attacks. BLACK SPOT is often a condition affecting plants deficient in POTASSIUM, PHOSPHORUS and MAGNESIUM. ANTHRACNOSE affected plants are often lacking in CALCIUM and NITROGEN. 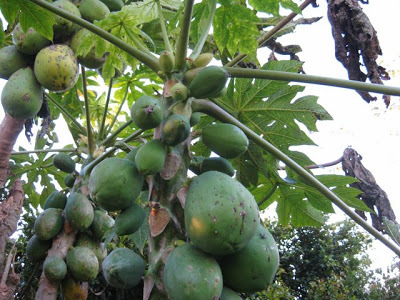 What this tells me is that the heavy rain we have had in recent times has depleted the soil of nutrients AND that papayas need regular feeding to keep them happy – a bit like us really! 1. Check the pH (see UNDERSTANDING SOILS at top of page) – the wrong pH can ‘lock-up’ nutrients. They don’t like acid soils – which is what we get after long periods of rain. 2. MULCH, MULCH and more MULCH – this will help to stop the nutrients from leaching away, add vital organic matter and essential nutrients. Lucerne mulch is particularly good for increasing potassium/potash. 3. GIVE THE SOIL A DOSE OF EPSOM SALTS – this is magnesium sulphate and will help with any magnesium deficiency. 4. GET INTO GOOD HABITS – feed the soil!!! – remember food is only as good as the soil it is grown in – chicken manure, rock dust and a soil drench of trace elements after heavy rain. Regular liquid feeding of the soil with COMPOST TEA (see previous post) or seaweed fertilizer will do the trick. WHAT TO DO WITH MY PLANTS? 2. You can cut pawpaw’s back quite hard, almost to ground level, and they will re-shoot from the main stem. When there is a flush of new growth DO A PREVENTATIVE SPRAY OF A COPPER BASED COMPOUND. The same PAPAYA – now healthy – after cutting right back, feeding with an organic fertiliser (compost and rotted manures – which helps to correct pH imbalance and provide the macro-nutrients of nitrogen, phosphorous, potassium and calcium), mulching and applying some complete trace elements (supplying all the essential micro-nutrients like iron, manganese, boron etc) and monthly liquid feeds with compost tea during spring and summer. Hello. I have had bunchy top on my tree many times. Each time I cut it back to almost ground level, hoping for a miracle. I cut it back quite some time ago and now have what appeared to be a very healthy and productive fruit bearing tree. Needless to say when the fruit ripened (just a couple of weeks ago) a number ripened all at the same time, but on cutting (and this was every one of them) they was little of the fruit that I could salvage. 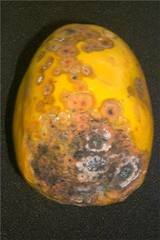 The fruit had hard cores within the pawpaw. It was not a particularly sweet fruit either. I have had this before from time to time in buying fruit from the supermarkets, but was so disappointed to have it happen to my own fruit. I probably should have thrown them all into the composite pile and not eaten as much as I could, but now I am thinking that maybe I should take the tree out all together and not add any more fruit to the mulch in case I spread disease. Do you have any thoughts on the problem that I might be experiencing? I would welcome any comments. Thank you. 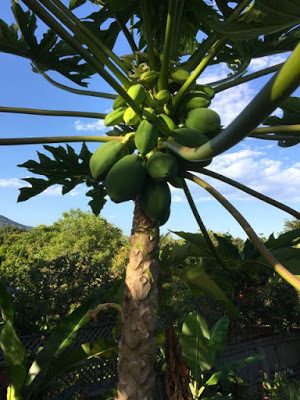 hello Diane – thanks for your blog – how do you destroy a papaya tree? Yes, it's common to 're-work' old or diseased papaya trees by cutting them down to a more manageable height. This is also the time to pay attention to giving them a complete organic fertilizer and mulching them. I often use the green fruit, if the damage is just cosmetic, in a shredded green papaya salad. Hi, we recently bought a papaya. In your above explanation, you say black leaf spot can be treated. THen you say destory the affected plants, could you clarify please, do I destory the tree if it get's black spot?